Leroy Gordon Cooper, Jr. , also known as Gordon Cooper was an American aeronautical engineer, test pilot and NASA astronaut. Cooper was one of the seven original astronauts in Project Mercury, the first manned space effort by the United States. He was the first American to sleep in orbit, flew the longest spaceflight of the Mercury project, and was the last American to be launched alone into Earth orbit and conduct an entire solo orbital mission. 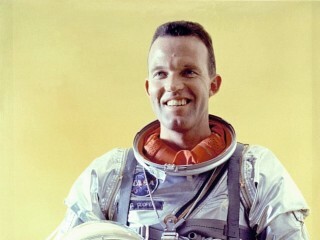 Gordon Cooper was one of the original Mercury 7 astronauts, the first Americans chosen for space flight duty by the National Aeronautics and Space Administration (NASA). Cooper had flown jets in Europe and America as an Air Force pilot throughout the 1950s, finally becoming an engineer and test pilot at Edward Air Force Base in California. In 1959 he was chosen from among hundreds of pilots to join the NASA astronaut program. (The other Mercury 7 astronauts were John Glenn, Alan Shepard, Virgil "Gus" Grissom, Scott Carpenter, Wally Schirra, and Donald "Deke" Slayton.) On May 15th and 16th of 1963, Cooper orbited the Earth 22 times in Faith 7, the last of the Mercury flights. On August 21st of 1965, he and Pete Conrad were launched in Gemini 5. They orbited the Earth for eight days, proving that humans could live in space long enough to fly to the moon and back. Cooper retired from NASA and the Air Force in 1970. He later served as a vice president for Walter E. Disney Associates, the research and development arm of the Walt Disney corporation. His 2000 book Leap of Faith was a personal history of the early days of American space flight. At Disney Associates, Cooper helped plan Disney's EPCOT Center in Florida... Cooper and Conrad covered 3.3 million miles in Gemini 5... According to NASA's biography, Cooper was originally scheduled to be the commander of the ill-fated Apollo 13 flight in 1970. However, he was replaced by Alan Shepard, who in turn was replaced by James Lovell... Cooper was portrayed by actor Dennis Quaid in the 1983 movie The Right Stuff... In Leap of Faith, Cooper stated his firm belief in UFOs, saying he had chased some himself while an Air Force pilot in Germany in 1951. View the full website biography of Gordon Cooper.